Here you’ll find information on upcoming events with Imogen. If you’re interested in hosting us for an event get in touch. 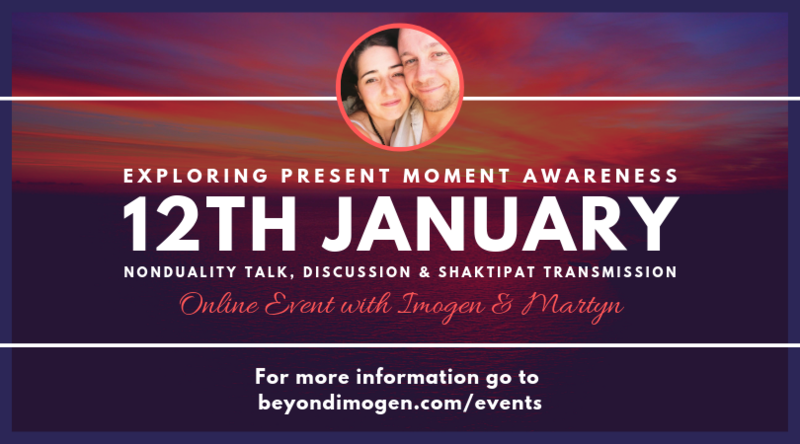 We welcome you to join us (Imogen & Martyn) for an informal and friendly gathering online where together we’ll explore the essential nature of our reality. There’ll be the opportunity for Q&A, and at the end there will be a group Shaktipat awakening transmission. By attending this event you consent that your voice and/or image may be used publicly for the sharing of Satsang. Please inform us prior to the event if this is an issue. For the month of February I will be offering weekly online Silent Meditation and Shaktipat Awakening Transmissions. These events will last 30 minutes, held in silence and will begin promptly at 7pm. The first 15 minutes there will be silent meditation followed by 15 minutes of Shaktipat Awakening Transmission. I will be doing these weekly Transmissions using Zoom.US video conferencing software, for which you will need an account and software (Both FREE) to join. I don’t know if I will continue beyond February but I will post any updates to the schedule here.